Three MAT Practice Tests are currently available with analogy items like those you will find on the actual MAT. Each Practice Test consists of 120 multiple-choice analogy items. Of the 120 items, 100 have appeared on actual MAT test forms and will be counted toward a simulated score, while the other 20 items are experimental and will not count toward your score. About 40% of the items appeared on previous versions of the MAT Practice Tests. Access to 120 analogy items and their correct answers and explanations that can be reviewed as many times as you wish (not printable). 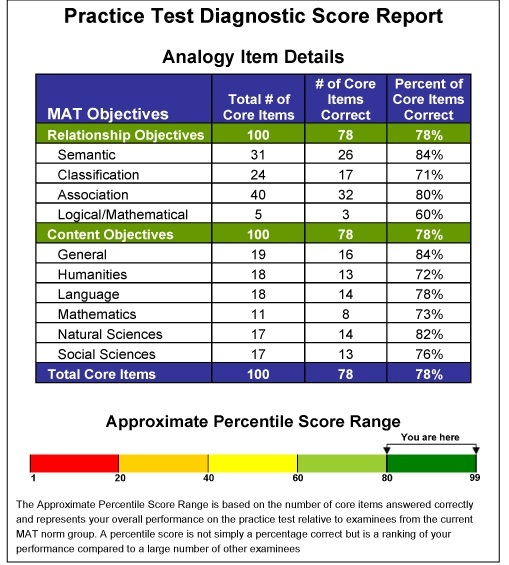 A printable Diagnostic Score Report that shows the number and the percent of items answered correctly for each item objective to help you know your strengths and weaknesses, and an approximate percentile score range indicating how your score compares to scores of other examinees from the same reference group used to determine actual MAT percentile ranks. You may choose to score the Practice Test at any time. Once your test is scored, you will be able to continue to review the items, and print out a Diagnostic Score Report as many times as you wish until your one-year purchase period expires. However, you will not be able to score the test more than once. No refunds will be granted. Be sure to review the information about browser requirements by clicking on the “Browser Requirements” link. Click the “Create User Account Link” from the Login page to create your user account. Once you have created your account, you may purchase MAT Practice Tests from the “My Profile” page. You will have one year to use your practice test before access to it will expire. If you have already created an account, click the “Login” link to get to the “My Profile” page. Copyright © 2017 by NCS Pearson, Inc. All rights reserved.